Julie Jean White’s resume is laden with TV and movie credits. First and foremost though; the Minnesota native is a talented singer/songwriter. Her self-released debut, “Silver Heart” combines the purity of an independent artist with the polish of a seasoned veteran. The album is thematically heavy. The 36 minutes deal with love and loss, domestic violence and women’s empowerment. What makes the record so appealing is its simplicity. The instrumentation is sparse but rich. The jazzy electric piano on Daises and the subtle pedal steel on Pillow Talk Talkin’ are just present enough to enhance but not overpower the vocals. White’s mezzo is silky and authoritative. Her naturally lower register gives her a singular ability to sonically convince the listener that a woman is still strong and in control even if the lyrics say she is vulnerable and beaten. From the heartbreaking opener Undone to the domestic turmoil of Bridge I Burn, the characters may be down, but you never feel like they are out. On the latter tune, a woman gets shot but the listener still has hope thanks to White’s reassuring voice. She lightens up a bit with A Real Man. It speaks to the value of the traditional male and is reminiscent of vintage Bonnie Raitt. She has won a bevy of awards, including American Songwriter Magazine’s Lyric contest and was a Kerrville New Folk Finalist this year. Listening to this album is like sitting in The Bluebird Café on a Thursday night. This is pure talent. 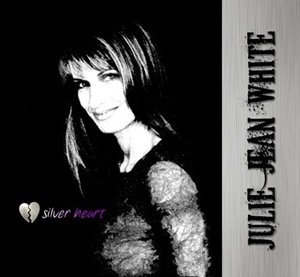 1 Comment on "Julie Jean White Silver Heart"
Good call MR! JJW is a rare find – I saw her perform in Nashville recently and she is the real deal – the full package – whatever you want to call her… you want to call her! She’s truly amazing. Your review is dead on – good find! Didn’t know where to find her music – thanks for posting this!! !